Definition at line 621 of file MachO.h. Definition at line 622 of file MachO.h. Definition at line 623 of file MachO.h. Definition at line 624 of file MachO.h. 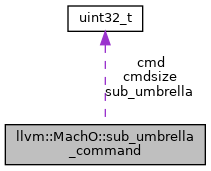 Referenced by llvm::yaml::MappingTraits< MachO::section_64 >::mapping(), and llvm::MachO::swapStruct().